The pictures above are present on Romanian coins through the kind permission of Mr. Radu Lissner. 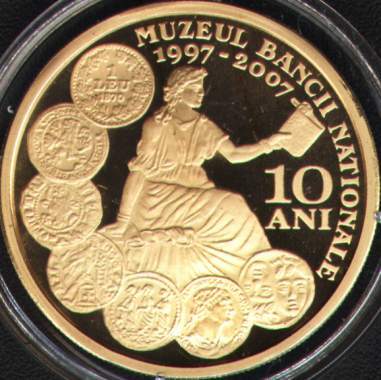 In 2007, 140 years were commemorated since the passing of the "Law for establishing a new monetary system and for manufacturing national coins" (Legea pentru înfiinţarea unui nou sistem monetar şi pentru fabricarea monetelor naţionale) in the Parliament of Romania. 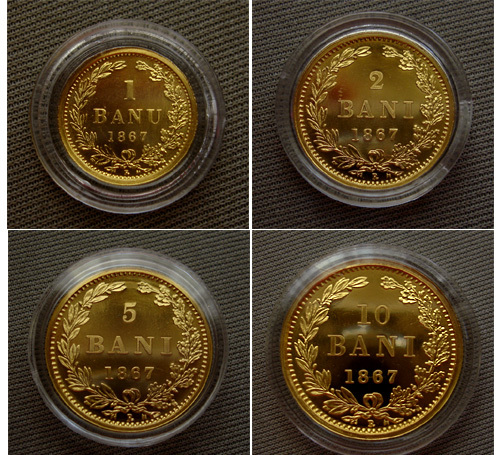 With this occasion the National Bank of Romania issued a set of four replicas of 1 BANU, 2 BANI, 5 BANI and 10 BANI 1867 and a set of three medals that reproduce coin proposals from the time when prince Alexandru Ioan Cuza (Alexander John Cuza, 1859-1866) ruled the United Principalities / Romania. 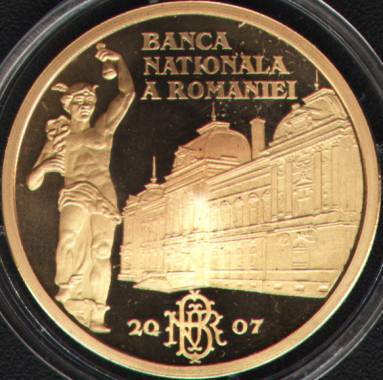 In the same day the National Bank of Romania put on sale another set of medals, one from tombac and one from silver, set dedicated to the 10th anniversary of the re-establisment of the NBR Museum. Unfortunately this museum - specialized in numismatics - does not admit public visits. All the replicas are made from gold (with title 99.9%) and have the same diameter as the original coins. The replicas are heavier than the original coins: 1.75, 3.5, 8.75 and 17.2 grams instead of 1, 2, 5 and 10 grams. Each coin was issued in a mintage of 250 pieces. Under the ribbon that ties the laurel and oak branches lies an R from replica instead the name of the mint. The replicas are made at B.U. quality. The monetary reform of 1867 improved the economy of Romania. After the introduction of bani and lei struck coins, most foreign coin species were officially withdrawn from circulation in 1873.